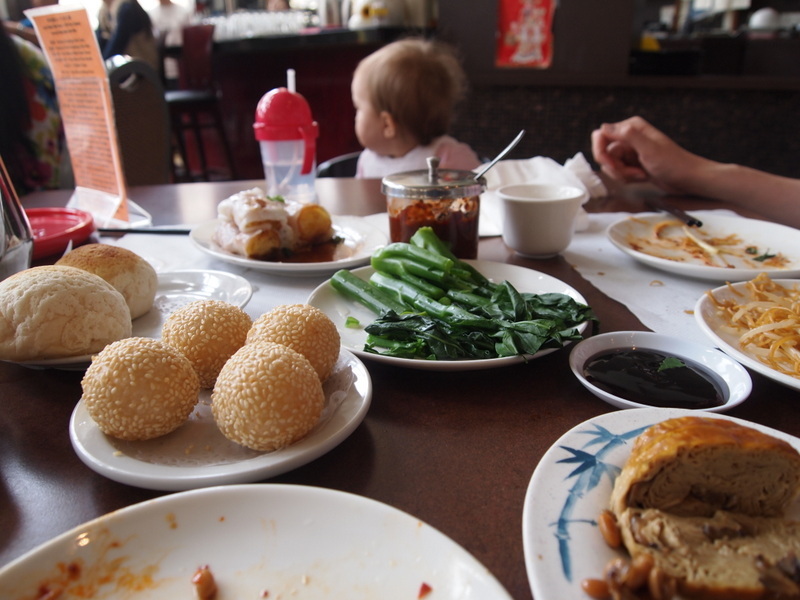 Two delicious taro buns left center, chilled bean curd skin lower right, disinterested toddler center top. I realize most people don’t plan their dining experience around taro buns. * And I don’t know for fact if this is the best: it’s true, I haven’t tried every taro bun in every Asian restaurant in the Bay Area. But if any of them can outdo the delicate fluffiness and light, sweet taro innards on offer at Fu Lam Mum Chinese Restaurant in Mountain View, I’ll gladly devote an entire blog in their honor. Not only do the taro buns at Fu Lam Mum rise above all other taro buns, but they’re also on par with some of the best pastries around, whatever the ethnic origins of said bread, French, Danish, or, dare I say, Tartine. And it’s not just me saying this. My dining companion, with in-depth knowledge of taro buns from living five years in Japan and traveling throughout Asia, was equally impressed. 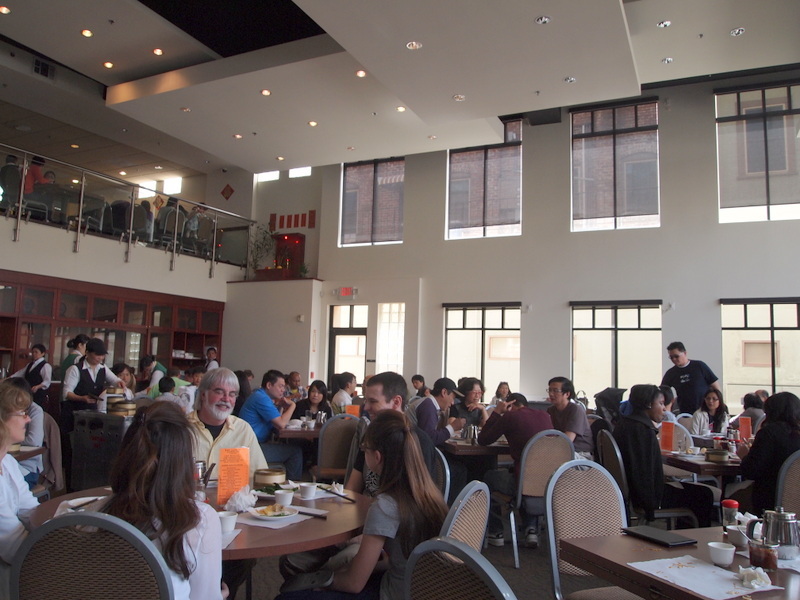 The restaurant also had a number of dim sum carts wheeling around with vegetarian options, more than typical. Besides standards like steamed Chinese broccoli and flat steamed rice noodle rolls, there were more unusual offerings like a steamed rice noodle roll wrapped around fried Chinese dough, excellent Singaporean style fried rice noodles, pan fried scallion cake, seasoned seaweed and chilled bean curd skin. Most of Fu Lam Mum’s customers are Chinese, which means the restaurant also offers more exotic items like beef tripe with ginger, preserved egg porridge, chicken feet, chilled jelly fish and durian paste pastry. But if and probably when I go back, it’ll be for the best taro buns this side of Hong Kong, and definitely not for the chicken feet. The popular Fu Lam Mum on a Sunday afternoon.